Modern Data Platform Map represents reference organizational layout of most important data pillars and services and corresponding groups of specialists in enterprises. 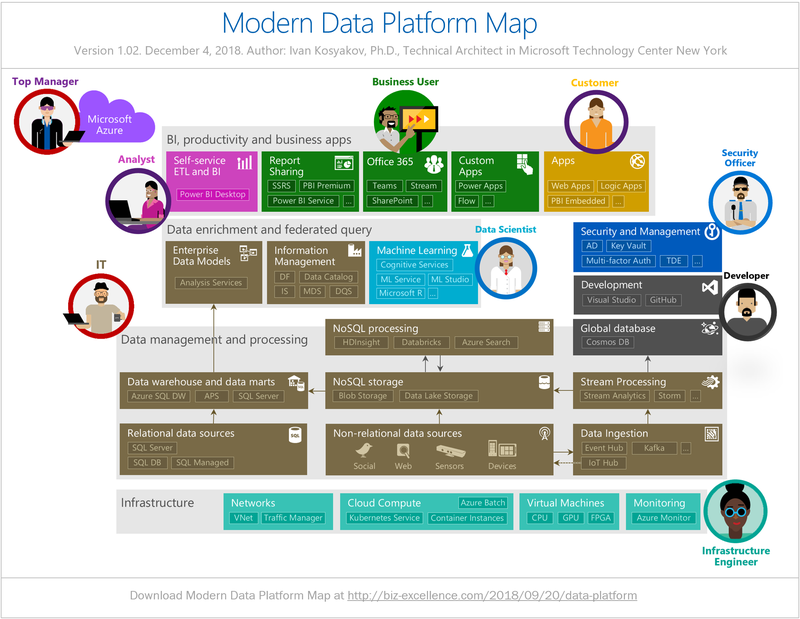 In the following video I make a quick overview of Microsoft Data Platform. I will provide more details in subsequent posts and videos. Please post your questions, suggestions and feedback below. BI and Analytics: Power BI including Power BI Desktop, Power BI Service and Power BI Premium, SQL Server Reporting Services (SSRS), Office 365, Teams, SharePoint, Microsoft Power Apps, Microsoft Flow, PBI Embedded, Logic Apps etc. Data enrichment and federated query: Analysis Services, Azure Data Factory (DF), Azure Data Catalog, SQL Server Integration Services (IS), SQL Server Master Data Services (MDS), SQL Server Data Quality Services (DQS), Cognitive Services, Azure Machine Learning Studio, Machine Learning Service, Microsoft R/ML etc. Data Management and Processing: SQL Server, Azure SQL Database (DB), Azure SQL Managed Instance, Azure SQL Data Warehouse (DW), Analytics Platform System (APS) AKA Parallel Data Warehouse – PDW), Azure Blob Storage, Azure Data Lake Storage (ADLS), Azure HDInsight, Azure Databricks, Azure Data Lake Analytics (ADLA), Azure Stream Analytics, Azure Event Hub, Azure IoT Hub, Kafka, Azure Cosmos DB, Azure Search etc. Security: Azure Active Directory (AD), Azure Key Vault, Multi-factor Authentication, Transparent Data Encryption (TDE) etc. Development: Visual Studio (also supports Data Tools and ML Tools), GitHub etc.